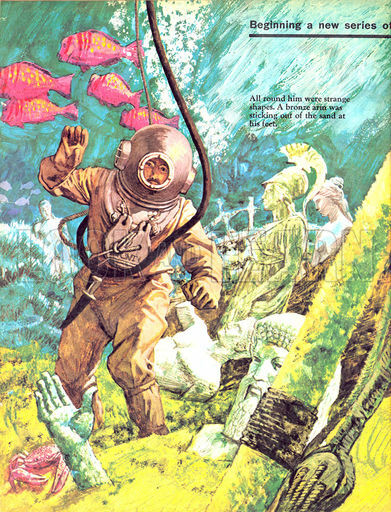 Sosa, left and Morfini, right, make a major discovery near Thebes. Copyright The Min Project. The long hidden passageway and at the far end the image of Osiris – this was the first view of the discovery Sosa and Morfini encountered. Copyright The Min Project, Photo by Paolo Bondielle. That’s how archaeologist Irene Morfini described the moment when she and her colleague Mila Alvarez Sosa discovered an amazing new tomb complex at Sheikh Abd el-Gourna, near Thebes in Egypt. The two young women had just made their names—and their careers—in the male dominated field of classical Egyptian archaeology. Mila Sosa, PhD., leader of the Min Project. 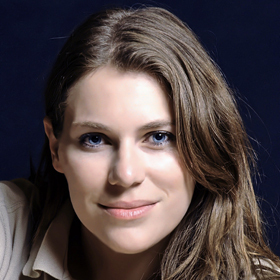 A Spanish archaeologist with a bright future in the classical world of Egyptian archaeology. Copyright The Min Project. Those concessions were for “TT109 (tomb of Min) and Kampp -327- (anonymous tomb).” The tomb of Min had been discovered as far back as 1887—but it remained largely undocumented. The second tomb is attached to the first and had never been published. The Min tomb had even been used for storage and as a stable at one time. 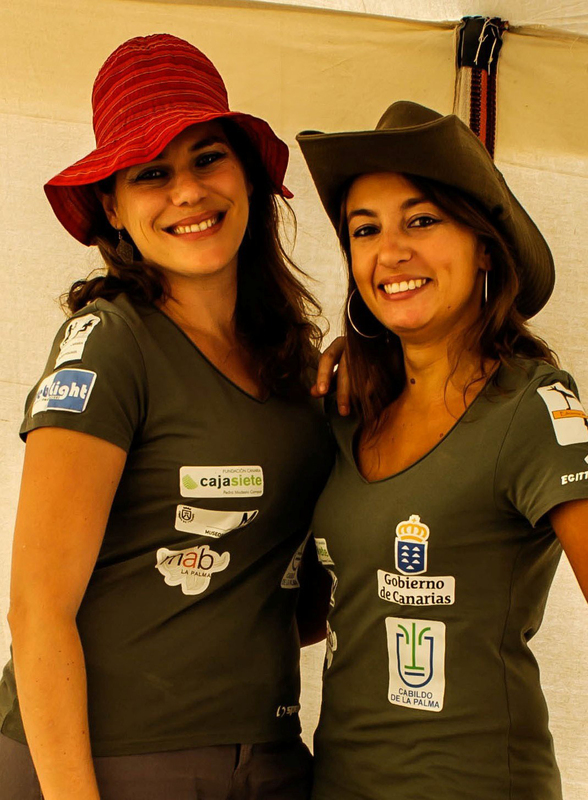 Despite the unspectacular nature of the site, Sosa and Morfini raised funds and began work. Both tombs had been robbed, vandalized and damaged by earthquakes over time. A team of specialists moved into the new area under the direction of the two archaeologists. 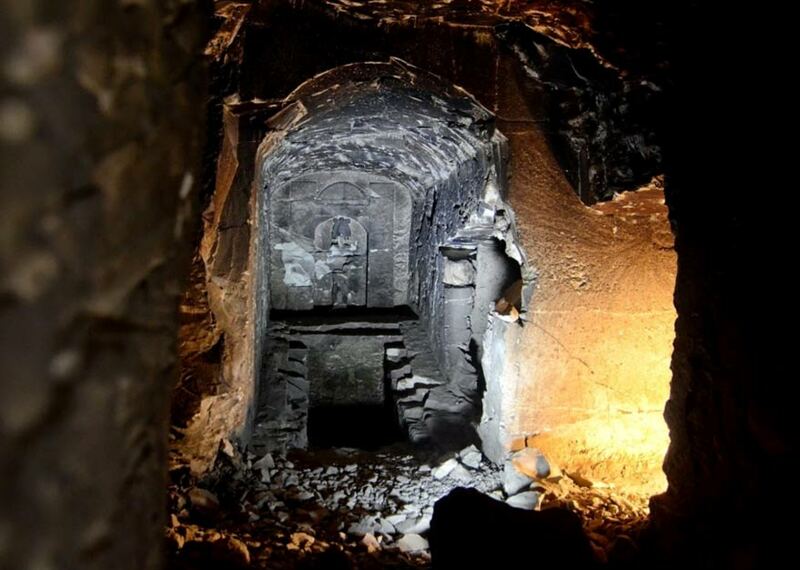 They found a complex system of shafts and rooms carved into the rock—all designed to mirror the Osiris legend of the journey and resurrection of the dead soul. For the rest of the archaeological season, during autumn when summer temperatures cool down, the team began the now larger task of documenting the contents of the tomb complex. 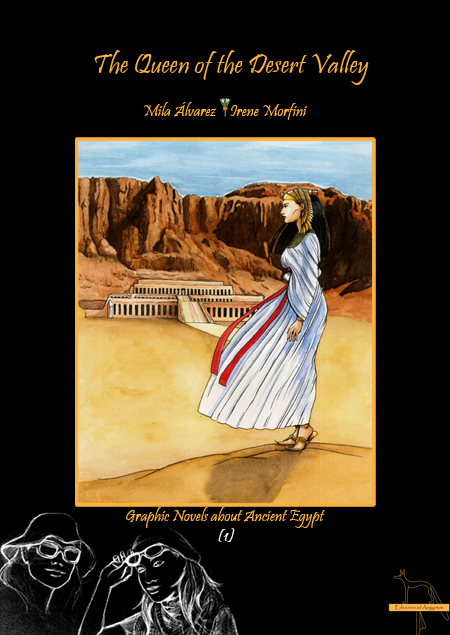 The cover of the graphic novel by Sosa and Morfini. There are English and Spanish versions available. One of the major segments of the Archaeology Hour will be Archaeological Travel. Segment producer Rob Steele will be covering the host of opportunities around the world for tours to archaeological sites from active digs to monuments and sites such as the Egyptian Pyramids. Recently we discovered a different kind of ‘travel’ so compelling that we had to include it in our coverage. 360fied.com is a new site that offers absolutely spectacular photography of major destinations in Egypt. The site allows you to select a given feature — we have a screen shot of the temple of Kalabsha, once located at Bab al-Kalabsha south of the Aswan Dam. When the dam was built, Germany funded a two year project to re-locate the temple above the waters of Lake Nasser. Screenshot courtesy of 360fied.com of the Kalabsha Temple. The site offers spectacular 360 degree views of famous sites. The temple is a great example of Egyptian architecture in the Nubian region. It was built during the Roman occupation of Egypt in ca. 30 B.C., and features many fine reliefs showing the God Horus – and also inscriptions by Roman Governor Aurelius Besarion in 250 B.C. (it forbids pigs in the temple!). Some five hundred years later the Nubian King Silko recorded his victory in battle over a local tribe, complete with a fine carving of himself in Roman armor and on horseback. 360fied.com has done a remarkable job of recording the Temple and its carving in high res photography. Site navigation allows the viewer to zoom in on features and views, and then make 360 degree turns that gives the viewer the ‘feel’ of standing in the midst of the temple. The Archaeology Hour is keen to promote travel to historical and archaeological sites–but not everyone can do so. 360fied.com offers an alternative, a rich visual virtual tour of the architectural wonders of Egypt. We certainly hope 360fied.com does expand its coverage to other world heritage sites. If the Egyptian photography is anything to go by it will offer stunning visual access to these sites to generations of ‘visitors’ who might otherwise never be exposed to these ancient wonders – and the need to preserve them. The Archaeology Hour will report on new sites added to 360fied’s portfolio as they come online. Please visit them at www.360fied.com. The Pilot for The Archeology Hour is on track as we schedule interviews with archaeologists and investigators as far afield as Egypt, Italy, Sweden. the UK and the US. 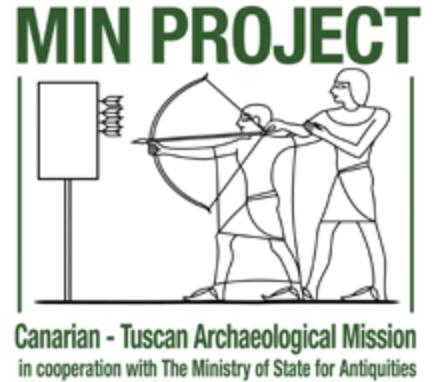 In addition new segment producers (upcoming announcement) are working on news and features on archaeological travel, major museum exhibits around the world, archaeological volunteer projects and reviews of major new historical and archaeological books. Our first book will be “The Lost Papers of John Bell Hood” by author Sam Hood from Savas-Beatie and hailed as having major revelations on the history of America’s Civil War. Planned for the pilot and upcoming broadcasts will be news direct from the archaeologist in charge of an exciting new discovery at Sheikh Abd el-Gourna in Egypt. There two archaeologists have discovered a complex of tombs beneath a smaller tomb found in 1887. The early explorer missed a maze of chambers and shafts designed to mirror the legend of Osiris, the Egyptian god of the underworld. Mila Sosa and Irene Morfini sent the last season completing a pre-disturbance survey of the complex, recording wall inscriptions, a statue of the God Osiris and the remains of numerous mummies destroyed and tons apart by early tomb robbers. In an upcoming interview, Morfini will discuss the upcoming season starting on October. This will mark the beginning of excavations inside the tomb complex and we will learn how the two archaeologists plan to proceed. 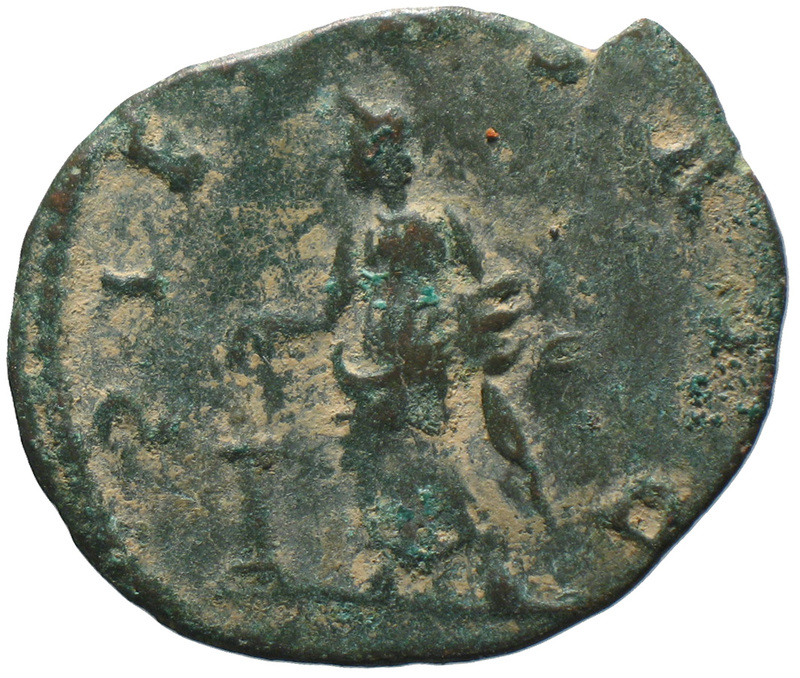 In the UK we will be talking to Vincent Drost, the Project Curator of the Romano-British coin finds at the Department of Coins & Medals at the British Museum. He is studying the Seaton Down Hoard – a massive cache of Roman coins found by a metal detectorist last year. The dates on the coins cover a hundred year period and were buried long before the Romans left Britain and viking and saxon hordes–which raises many questions. Why were they buried? Who buried them. Why would they have been saved over such a long period of time? 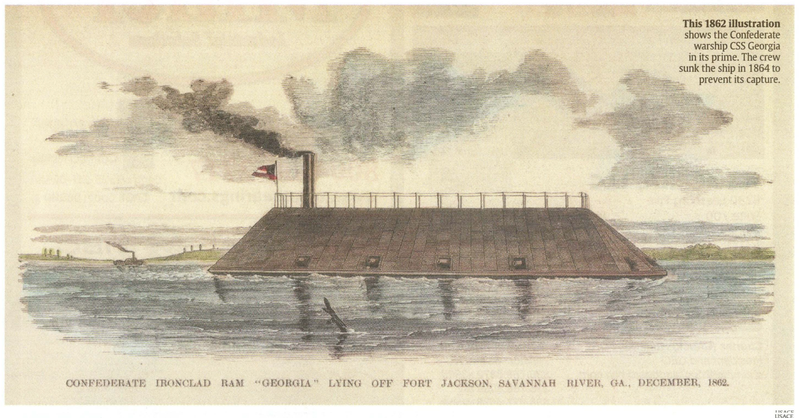 In the US we will be looking at the recovery of the CSS Georgia, a Confederate gun boat sunk on the edge of the channel into the harbor at Savannah Ga. This is a daunting project. Over the past forty years the archaeologists with the US Army Corps of Engineers have dived on the wreckage to study it and gather information on its eventual removal. The wreck is mass of tangled iron and debris accumulated over the hundred and fifty years since it was scuttled by retreating Confederates. The Corps will remove the wreck as part of a harbor and channel expansion project. The work will be under the supervision of Corps archaeologist Julie Morgan. Corps spokesman Billy Birdwell tells the Archaeology Hour, “We have begun to remove some pieces of the wreck and some loose material around it. The main work will take some time.” We hope to bring you an interview with Julie Morgan in the near future and will post video on our YouTube Channel. The CSS Georgia as it looked shortly after its launch (Coe, Today).